Have you always wanted a vehicle that can drive on both land and water? How about an amphibious car that needs a little testing and troubleshooting? If you're equal parts wealthy and crazy, the Dobbertin HydroCar could be for you. Rick Dobbertin is well known for his imaginative projects. After constructing a pair of award winning hot rods in the 80s, he built the Dobbertin Surface Explorer, a 32 foot long amphibious vehicle constructed out of an old milk tanker. Dobbertin took the Surface Explorer around the world logging 30,000 land miles and over 3,000 miles in the open ocean. Perhaps most importantly, the Surface Explorer was voted one of Jalopnik's 10 best Post Apocalyptic Survival Vehicles a couple years ago. Dobbertin nearly made it around the entire world with the Surface Explorer before financial problems brought him back to upstate New York. In a bold and somewhat questionable move, Dobbertin sold the Surface Explorer and his Award winning Hot Rods to finance the Dobbertin HydroCar you see here. As you can see from the pictures, almost every part of the HydroCar is custom, one off, or handmade. The vehicle actually changes shape, lowering and extending pontoons when you switch it from land mode to water mode. 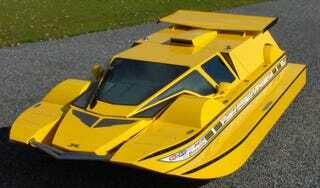 The tunnel hulled HydroCar is propelled by a 572 Cubic inch Big Block Chevy that produces 762 horsepower. While the HydroCar is clearly well built, after nine years and 18,800 hours, the custom vehicle is still not quite done. Several videos included in the auction show that while the HydroCar is improving as a result of testing, Dobbertin has been unable to get the boat to plane. Without being on plane the boat can't come anywhere close to the estimate of the HydroCar's 60 MPH water capability. Accordingly the HydroCar, which is currently listed on Ebay for $777,000 is "being offered as a more of collector car than something to be used on either land or water on a regular basis". Dobbertin points out his lack of funds and weather restrictions on testing as the main contributing factors forcing the sale of the HydroCar. Unfortunately, it's possible the same financial crisis that is keeping Dobbertin from finishing the HydroCar might make it even harder for wealthy Amphibian automobile enthusiasts to justify purchasing it.